You are here: Home / News / At the Pride March: Labor Against Hate! At the Pride March: Labor Against Hate! 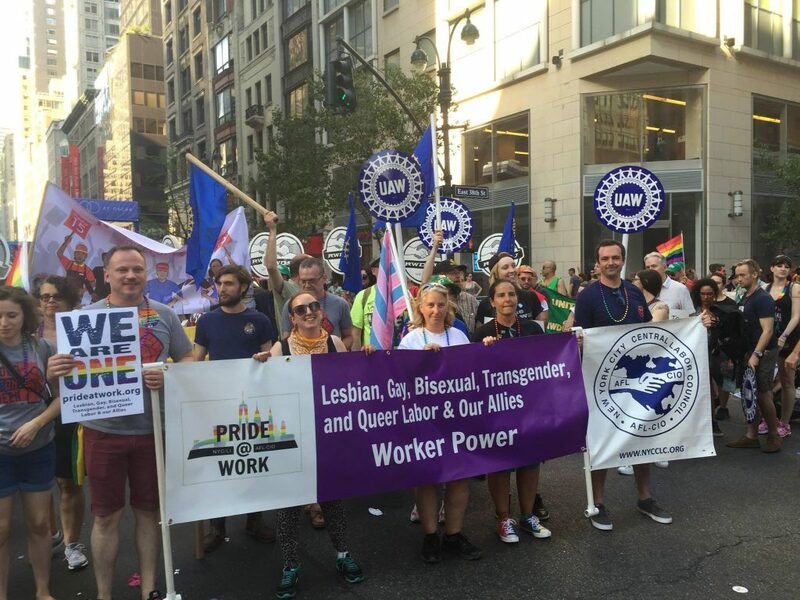 In response to the terrorist hate-crime in Orlando, NWU joined the Labor Against Hate contingent at the NYC Pride March. June 26 was quite possibly the biggest Pride March in NYC history. The massive turnout was in large part a response to the anti-Gay terrorist hate-crime committed at the Pulse nightclub in Orlando, Florida just two weeks earlier. It was a resounding statement against fear, terror and the spread of assault weapons, and in defense of the LGBT community. NWU and other UAW sister locals joined Pride at Work and other unions in the Labor Against Hate contingent. This included TWU Local 100, SAG-AFTRA, Laborers Local 79, RSDWU (retail workers), Walmart workers, an IBEW delegation of Trans electricians from Los Angeles and many more.